A new emergency contact card has been developed by a Shropshire legal firm to complement Health and Care Lasting Powers of Attorney. Wace Morgan Solicitors, based in Shrewsbury, is introducing the ‘Health and Care Cards’ as part of its campaign to encourage clients to plan ahead. “We would urge everyone to think about their future financial and health requirements and how important decisions will be made in the event of their mental or physical incapacity,” said Emma Jacobs, of Wace Morgan’s private client team. “Many people are now drawing up and registering a Lasting Power of Attorney document specifically covering their health and care. This appoints someone to legally make medical and welfare decisions on their behalf if they are no longer capable of making such decisions themselves. “We always advise that our client’s doctor keeps a copy of this registered document with their medical records. However, we were concerned that in the event of an emergency, its existence may not be known about so the client’s wishes could be compromised. “This could be, for instance, if an ambulance was called to a person and a treatment decision was made against the person’s express wishes, of which their attorney was aware. “Consequently we decided to produce a free wallet-friendly card confirming that the person has a Health and Care Lasting Power of Attorney and including GP, solicitor and attorney contact details. “We are advising clients to carry the card at all times so that medical professionals know who should be contacted for decision-making in case of a crisis,” Emma added. 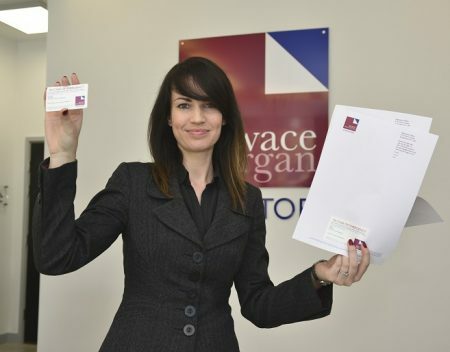 Wace Morgan is believed to be the only Shropshire legal firm to be offering this card.